A sum-of-parts analysis shows 20% upside for Hewlett Packard Enterprise based on conservative valuation and 66% upside in a bull case. Management will keep returning significant capital to shareholders through share repurchases and dividends. Spun-off companies have good chances to realize synergies under new management and unlock value for shareholders. A spin-off from the PC/Print business Hewlett Packard Inc. (NYSE:HPQ), Hewlett Packard Enterprise (NYSE:HPE) itself has two spin-offs in store this year. 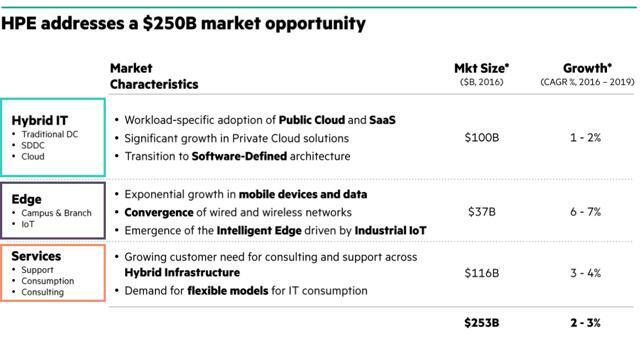 HPE’s management has decided to focus on the hardware side of the hybrid cloud (Enterprise Group) and divest both its consulting business (Enterprise Service) and its mature software business. Shares of HPE have outperformed the S&P 500 by over 20% since its inception, and there are reasons to believe the coming spin-offs can propel the stock further. A sum-of-parts analysis suggests HPE shares are undervalued by at least 20% on a conservative valuation. In a more optimistic yet still quite achievable scenario, HPE stock could be worth 66% more than the current price. HPE management agrees that its stock is still cheap and will buy back more stocks during 2017. Total return to shareholders in the forms of buybacks and dividend is expected to be about $3 billion in fiscal 2017 (about 7% of HPE’s current market cap). This return commitment is on top of the $3 billion returned to shareholders in 2016. The shareholder-friendly management also has pledged to “return significant capital to shareholders” post spin-offs in the future. In addition, the spun out companies could further boost HPE shareholders’ return. The consulting business after the spin-off will immediately merge with Computer Science Corporation (NYSE:CSC), and the combined company might achieve much higher margins because of synergies. In its press regarding the merger, CSC estimates first-year synergies of $1 billion and a run rate of $1.5 billion after year 1, with possible more synergies subsequently. To put these synergy figures into perspective, the $1.5 billion number is about half of the combined company’s adjusted EBITDA in fiscal year ’16. If CSC’s management can achieve its synergy target of $1.5 billion run rate, the forward EV/adjusted EBITDA is at about 5, a figure that is too low for this business. 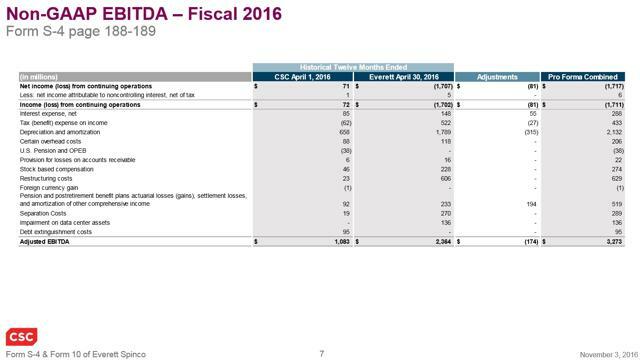 Even if CSC achieves only a $1 billion run rate synergy, the forward EV/adjusted EBITDA will still be a very low number of 5.5. In the other spin-off, HPE will separate its software business and merge it with U.K. software company Micro Focus (OTCPK:MCFUF). Micro Focus will issue new ADR shares worth 50.1% of the combined company to HPE shareholders. Micro Focus management has a proven record of acquiring mature software assets and then improving the company’s operating margins. From the investor presentation, we can see Micro Focus’ current businesses have a stunning high adjusted EBITDA margin of 46%, while the to-be-acquired HPE businesses have an adjusted EBITDA margin of 21%. Management believes it can bring HPE’s software business margin to 40%+ in 3 years and double the EBITDA of HPE’s software business. 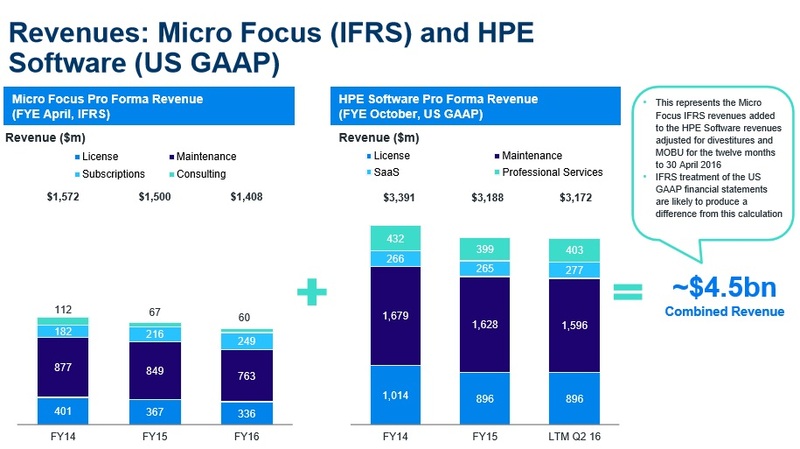 Chances that CSC and Micro Focus shareholders will approve the respective mergers with HPE’s business are high. Shares of CSC spiked almost 50% on the day of the merger announcement, and the stock finished 2016 with almost 100% gain. Shares of Micro Focus gained 10% following its own merger announcement and are currently trading around all-time highs. Positive stock price movements in these two companies indicate that market participants view these two mergers favorably and will very likely vote for the mergers. Furthermore, there is the H3C 49% equity interest value embedded inside HPE that might appreciate in the future. In 2015, HPQ sold 51% majority interest of H3C (HP’s server and storage business in China) to Tsinghua Unisplendour for $2.3 billion. The ownership change to Tsinghua Unisplendour could greatly benefit H3C’s sales in China. Before the ownership change, H3C, as a foreign company, had a hard time selling equipment to Chinese government entities because of national security concerns about US spying. Unisplendour is a state-owned company, and after the ownership change, H3C could finally start selling to the Chinese government. If H3C’s revenue improves in the future, the remaining 49% equity interest will improve in value as well. One more catalyst for the company is the repatriation of offshore cash if a tax holiday occurs. Most of HP’s 13 billion cash is held overseas, and after paying for one-time cash cost associated with the spin-mergers, an assumed 10% repatriation tax would leave about $6.4 billion of onshore cash (15%+ of the company’s current market cap.) 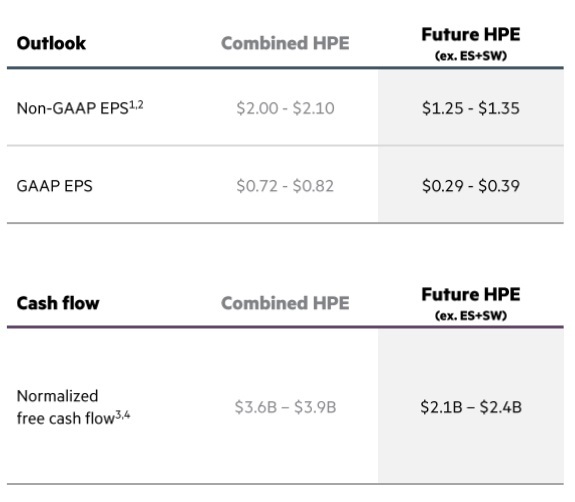 It is most likely that the leaner HPE post spin-offs, with a healthy projected cash flow, would not need to hoard all of that cash and management will return part of the cash to shareholders. This 20% base-case upside number feels very solid. 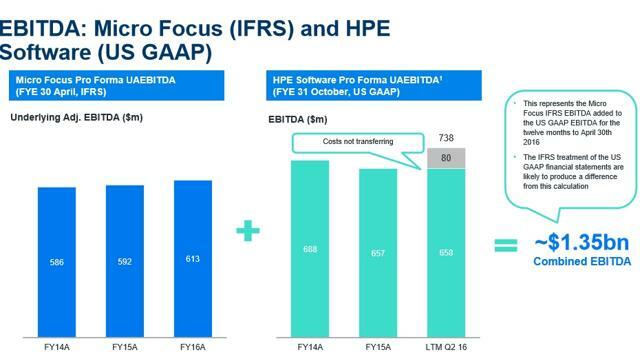 The value of the HPE software company in the base-case analysis is about 30% lower than the current market value based on Micro Focus’ share price. That means if the Micro Focus merger were to happen today (as of this writing on February 3, 2017), the base-case upside would be actually 25% instead of 20%. In the rest of the article, I will go through a detailed sum-of-parts analysis on HPE for people who want to know how I have arrived at the aforementioned possible base-case and bull-case upsides. I apply conservative metrics and assumptions to calculate each component’s value in the base-case analysis and apply more optimistic scenarios under the bull-case scenario. All figures except share prices are based on press releases, earnings calls, and analyst meetings of HPE, CSC, and Micro Focus. Let’s briefly go over terms of this deal: 1) CSC will merge with HPE’s Enterprise Services Group; 2) HPE shareholders receive approximately 50% of the new combined company; 3) Debt, pension and cash transfers between CSC and HPE (I will calculate this part in the net cash and liabilities sections). 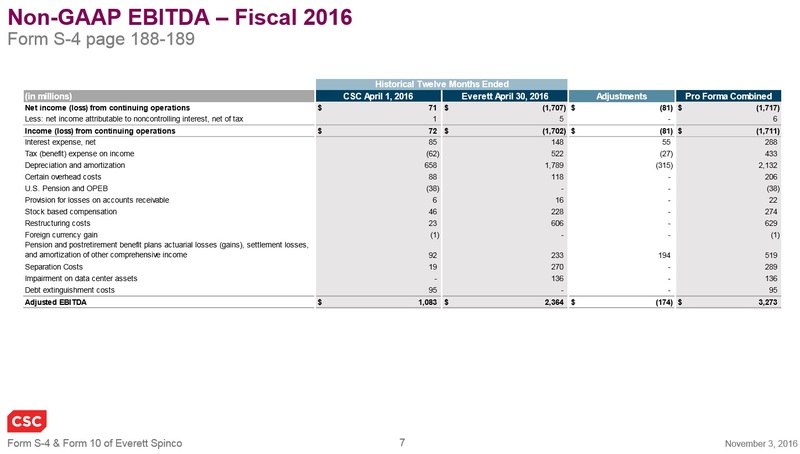 From the slides below taken from CSC, were the merger to happen on July 1, 2016, the combined company would have $955 million cash and $8,416 million debt plus pension cost. The pro forma combined company also would have $3,273 million adjusted EBITDA without accounting for any synergy. Although CSC confidently called this $1.5 billion synergy number “very strong,” I assume it only gets $1 billion synergy run rate in the base case and assume CSC fully achieves its synergy target in the bull case. CSC CEO also commented that there could be more synergy opportunities after year 1, but I do not include any additional synergies into the calculation, just to be safe. Keen readers might spot that the data are as of July 1st last year and wonder how the businesses of CSC and HP consulting services have fared since the merger announcement. After all, if businesses deteriorated in the more recent quarters, the forward EBITDA and valuation projections might come down. In the following quarters after July 1, CSC actually reported very encouraging results – taking the most recent half year, revenue in constant currency and adjusted EBITDA both grew over 10% (see CSC’s quarterly release here and here). Although revenue of HPE’s service business declined 2-3% during the last half year, margins actually improved by over 2.5%. Because HPE’s service business has been more or less stable and CSC has performed well, the outlook for this combined piece actually looks brighter than it was on July 1. The terms for this deal are: 1) HPE Software will issue debt and pay HPE $2.5 billion onshore cash; 2) After the cash payment, Micro Focus will acquire HPE Software and issue new Micro Focus ADR shares tradable in the U.S. worth 50.1% of the combined company to HPE shareholders. I consider Micro Focus as the 3G Capital of the software industry. Micro Focus management specializes in acquiring mature yet sticky software assets and optimizing margins on these assets through disciplined operations. Though maybe not so famous in the U.S., this UK-based company has rewarded its shareholders handsomely over the years. 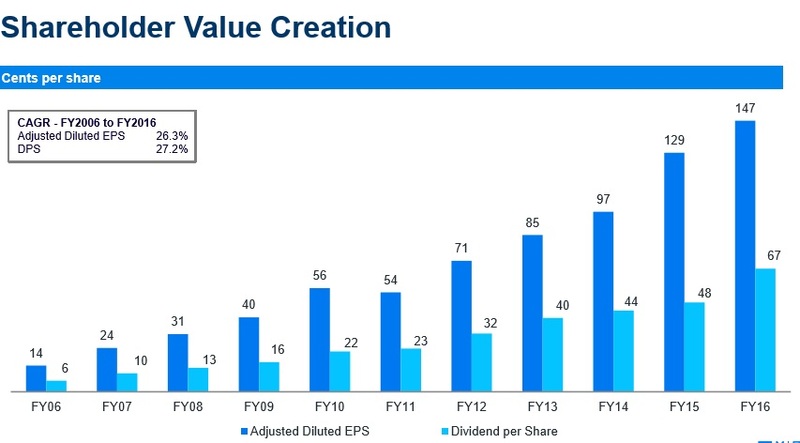 Adjusted EPS per share has been compounding at annual rate of 26% over the last 10 years. The stock has more than quadrupled within the last 5 years, and the dividend has increased 10-fold over the last 10 years. Management believes it can improve margin on 80% of HPE’s software business from 21% to over 45% within 3 years after the merger. The rest of 20% of the businesses are still growing, and I assume they will command a lower margin. 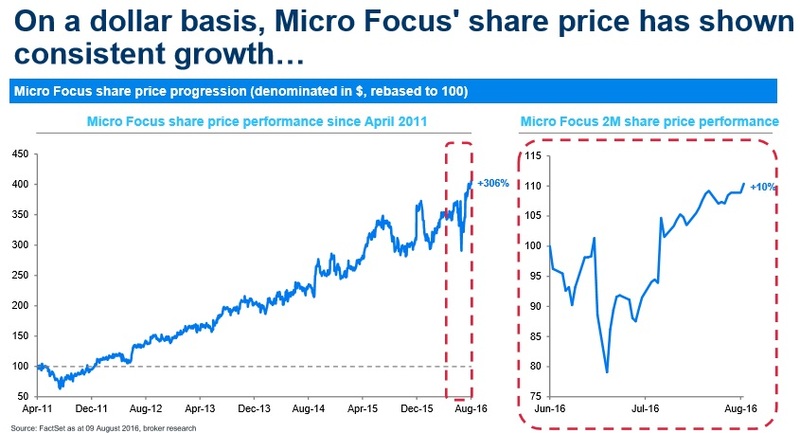 Seeing Micro Focus’ past record, I have high hopes that management will repeat its past success. However, in the base-case scenario, I still assume that management could not fully achieve its goal and EBITDA margin on its mature businesses peaks at 35%. If we also assume that the other 20% of the businesses have a 30% margin in year 3, we have a blended margin of 34% and about 42% for HPE’s software business under the base case and bull case respectively. Net debt for the combined company is about $5 billion. An interesting note here is that the base-case value is actually much lower than Micro Focus’ offer price for the HPE software assets (currently over $6 billion, based on Micro Focus’ share price). This shows that Micro Focus’ management itself is very confident of achieving its cost savings targets, and the London market agrees with management. In HPE’s Q3 conference call, HPE CEO Meg Whitman also said she herself would hold on to her Micro Focus shares after the spin-merger. However, since it is unclear what Micro Focus’ stock price will be at the time of spin-merger, a conservative fair valuation is useful in case the price drops in the future. You can also consider the gap between the base-case valuation and the market price as a hidden $2 billion upside for the base case. The remaining part of HPE will consist of its hybrid IT business, mobile and IoT business, technology services division, and financial services division. 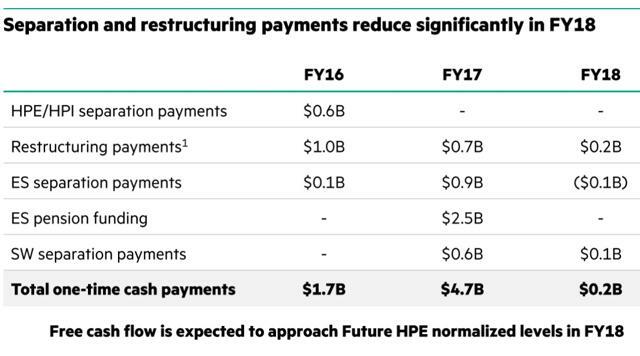 HPE forecasts 2-3% growth for the overall company and normalized free cash flow of 2.1-2.4 billion in fiscal 2017. I do not see a very big risk of the company underachieve this low-single digit growth target, because world GPD grows at around a similar pace, and the remaining HPE will be a much more focused company that can compete more effectively. Actually, HPE does not even need to beat its competition to accomplish this growth target – it simply needs to maintain its share as the market grows. If we assume net income and free cash flow grow at 2-3% in sync with revenue growth and a discount rate of 10%, we get an FCF multiple of 12.5-14.3. This is relatively straightforward. In the base case, I assume no value appreciation for the remaining 49% interest in H3C technologies, and the bull case assumes a 100% upside. In the Q2 ’16 conference call, HPE management revealed that leading to the sale of H3C’s equity interest to Tsinghua Unisplendour, H3C’s revenue increased 50%. This is a good sign for the company under the new owner and for the equity interest value HPE still holds. At the end of Q4 2016, HPE has gross cash of $13 billion. It will receive onshore cash from CSC and Micro Focus as part of the spin-merger deals. The company also needs to pay for some one-time separation costs associated with the spin-mergers. Here is the calculation on the cash position after the spin-mergers on the operating company level – we deduct the debt and cash owned by the financial service division. I still apply a 35% repatriation tax on the offshore cash in the base case, and I use a 10% repatriation tax in the bull case. Readers might also point out that HPE also has around $7 billion net financing receivables that it could monetize. 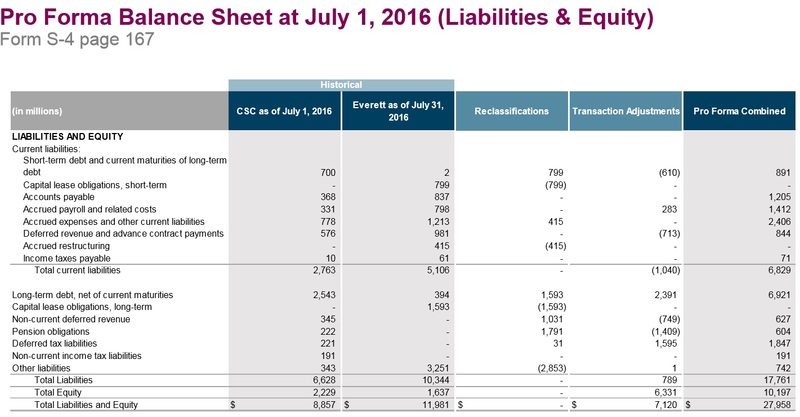 While this is correct, I exclude these financing receivable in the calculation because the HPE remain-co’s earnings include interests received from these financing receivables, so we do not want to double count here. Another piece of asset that some people might not be aware is HPE’s real estate. It owns a total of 18 million square feet of land, and the company’s headquarter campus situated in Palo Alto alone will fetch a very nice price during the current Silicon Valley real estate boom. Although I include none of these assets in my calculation, I do view them as bonus points that make this stock even more attractive on top of the headline upsides. Disclosure: I am/we are long HPE.